Posted on Mon, Jan 30, 2012 : 5:50 a.m. 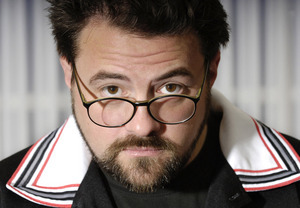 Following his highly popular one-man-show format, director/writer/podcaster Kevin Smith will discuss anything and everything when he takes over the big screen with "Kevin Smith: Live From Behind, Featuring 'Jay and Silent Bob Get Old,'" a one-night-only in-theater podcast event on Thursday, Feb. 2 at 9:30 p.m.
Broadcast to select movie theaters nationwide live from the Scotiabank Theatre in Toronto, Ontario, this special three-hour event will begin with Smith and frequent co-star and longtime friend, Jason “Jay” Mewes, hosting their highly rated podcast, “Jay and Silent Bob Get Old.” The evening will then switch gears as Smith takes the stage to tackle a wide variety of topics and issues during a live interactive, fan-generated Q&A with theater audiences across the country. For the first time, fans will have the opportunity to drive the conversation as they submit their questions and interact simultaneously with Smith live via social media networks throughout his unique “tell it like it is” stage show. Presented by NCM Fathom and AK27 Productions, tickets for "Kevin Smith: Live From Behind Featuring 'Jay and Silent Bob Get Old'" are available at participating theater box offices and online at www.FathomEvents.com and www.ak27productions.com. The event will be broadcast to more than 300 movie theaters across the country through NCM’s exclusive Digital Broadcast Network. Locally, the event will be broadcast at Quality 16, at 3686 Jackson Road.